Windows XP/2003/Vista/7/8/10 Total Image Converter supports a variety of image formats and can be used conveniently for converting TGA to JPEG. This is the handiest and most powerful image converter today’s software industry can offer. With Total Image Converter, you can manage as many files as you with. Batch option permits you to convert scores of TGA files to JPEG. This image converter permits you to crop, resize and rotate your TGA images. If you have a large collection of TGA images, you can make them web-compatible in less than no time. All you need to do is select images you are going to convert to JPEG and specify the target format. 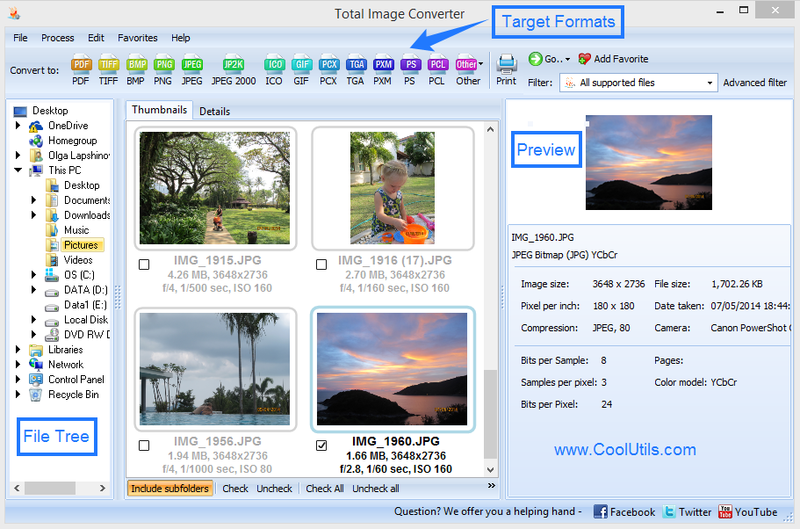 Total Image converter features a built-in viewer and thumbnail option. You can preview your photographs and tailor them as you need prior to conversion. Converting TGA to JPEG is very easy. You can do that in three ways: via interface, from the desktop and via command line. 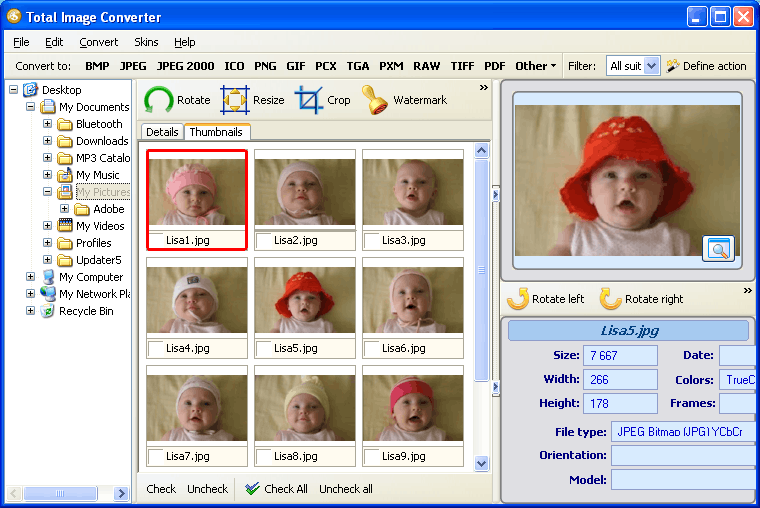 Launch the JPEG converter and select the folder with TGA files contained in it in. The file list will appear on the right. Now you are to select the images, which you are going to convert. To convert one or several files, check them manually. If you would like to convert the entire collection, press Check All. Now you can crop, rotate, resize and watermark your images. Use the options above the file list. Select the target format in the format bar or Convert menu. The wizard will guide you through the rest of the procedure. Select destination folder and color space and try different JPEG quality options. When watermarking your file, you can add comments and logos and apply frames to your images. When you are through with the settings, click Start. It will take moments for the program to convert your TGA images to JPEG. 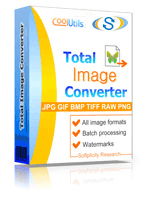 Total Image Converter supports a variety of image formats, including RAW, JPEG, TIFF, BMP, PNG, TGA, PSD, etc. 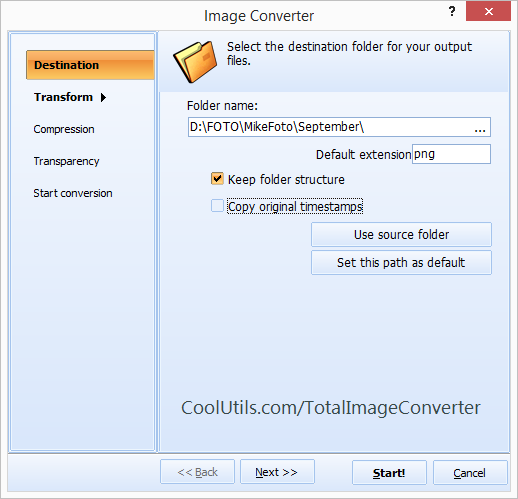 Total Image Converter is shareware, but it is really worth its price. If you have purchased this product, you will receive regular tech support and upgrades. You can download the free trial version and use it for 30 days prior to buying the license version.